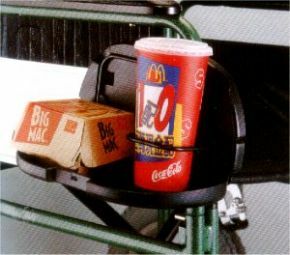 This moulded plastic wheelchair Drink Holder with a tray on the bottom and rings on the top holds cups and bottles. I just replaced mine after 3 good year of strong use, fully recommended, a 5 star product. We have tried a lot of drink holders for my partner's wheelchair, and a lot of them really aren't worth the money. They fall apart if you blow on them. This, however, is very sturdy. It's not huge by any means, but will project forward a bit, so you have to be careful with doorways, etc. It's a pity they don't do a single holder version of this, it'd be absolutely ideal, but for now, i'm buying another of these as a back up just in case the other breaks, because we've been though about 7 other different types that have lasted a week tops. This has been 1 month and still going strong. It has a shelf that folds down, then 2 separate drink holders that fold down if needed. It feels like it can hold whatever you put on it, and if it doesn't fit as it comes, the clamp fixture on the back can be repositioned by just drilling 1 new hole. I'm no genius, but it was easy. Great-arrived very quickly and was easy to attach. It\'s a really useful tray for all sorts of things, not just food and drink. Knocked it a few times in doorways as I\'m not used to it yet, but it\'s sturdy enough to have survived so far.